This week we have a very popular 1966 song, made famous by Frank Sinatra. It reached number one on both the Billboard Hot 100 chart and the Easy Listening chart. 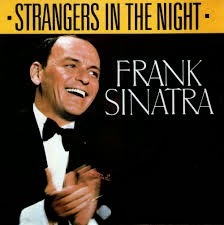 It was also the title song for Sinatra's 1966 album, Strangers in the Night, which became his most commercially successful album. The song also reached number one on the UK Singles Chart. Sinatra's recording won him the Grammy Award for Best Male Pop Vocal Performance and the Grammy Award for Record of the Year.